Marilyn Boylan had always believed that one day she will win a big lottery jackpot, and she told her children just that. So when she saw her numbers in the Jan. 06 Lotto Max draw, she was not surprised. She just called up her daughter Tracy and told her they would be claiming the prize together. Tracy shares that her mother worked hard to feed them when she was young. And even while the single mom struggled, she would always welcome less-fortunate into their home. To say that Marilyn Boylan deserved to win is an understatement. Now her financial problems are over, because she was one of 18 MAXMILLIONS winners on the Jan. 6 draw. She and her daughter were presented with a ceremonial check for a million dollars. She says one of the first items on her list is a passport because she intends to travel to England to attend Cruft’s, a big dog show. 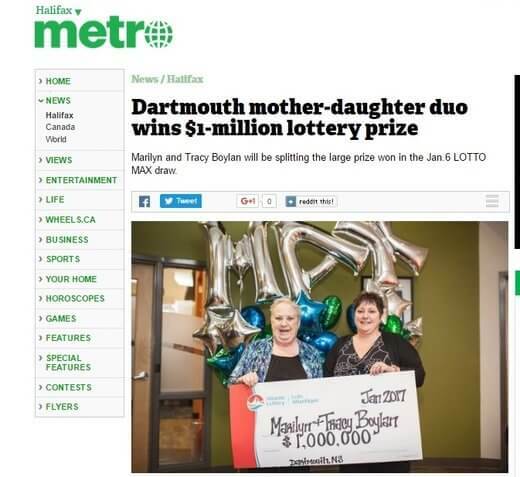 Even the Family Drug Centre on Portland Street in Dartmouth where she bought the winning ticket from got lucky – they were awarded 1% of the prize!